This Salthouse Studio has been installed at the foot of our customer’s garden in Ramsbury, Wiltshire to be used as an outdoor living area, so they can sit in comfort while they watch their grandkids run around in the garden. In this 2.4 x 3.0m Salthouse, there should be enough room for 2-4 people to sit inside, and with the full-length glass doors and windows, they will get an unhindered view of their garden to see what’s going on. roof, giving it a life-expectancy of 12-15 years. 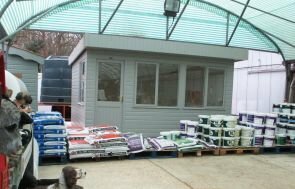 Valtti paint has been used to finish the building off in the colour Sage, which helps the studio to blend in well with the natural surroundings of the garden. The door and window furniture is polished brass for a smart feel. 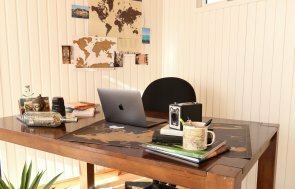 Full insulation, double glazing and painted matchboard lining on the internal walls will mean that the customer will get to use their new studio all throughout the year, if they wish to. Other features include a Natural lacquer on the floor, and there is black guttering on the on the rear of the building to catch rainfall running off of the sloping roof. 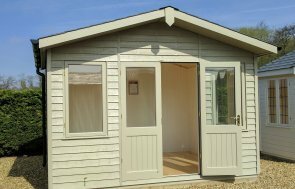 This is one of our more modern styles of garden building, so if you like the Salthouse, or you prefer more traditionally styled buildings, please have a look at our full range of Garden Studios, Summerhouses and Garden Rooms to find a style that suits you. If you would like more information on our buildings at all, you can call us on 01760 444229 to speak to our helpful team, or you can send us an online enquiry, which we will more than happily respond to.